Prosecutors have been investigating the trio. 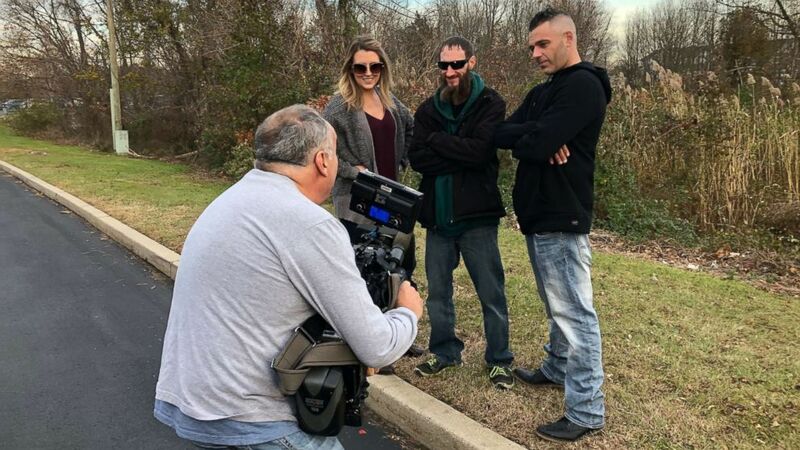 The "heartwarming tale" of a New Jersey couple helping drug-addicted homeless veteran Johnny Bobbitt took a stone-cold twist Thursday when a prosecutor said it was "predicated on a lie" designed to dupe thousands of people into contributing to a GoFundMe campaign. Bobbitt, and the couple, Kate McClure and Mark D'Amico, allegedly conspired to concoct a story to tug at the hearts and wallets of kind-hearted individuals, Burlington County Prosecutor Scott Coffina said at a news conference Thursday. They initially sought to raise $10,000, but the wildly successful GoFundMe campaign brought in over $400,000 and triggered an "international media blitz" that furthered the fraudulent campaign, Coffina said. Nearly every shred of the trio's story, including the part that Bobbitt used his last $20 to help McClure out of a roadside jam when she ran out of gas, was bogus, Coffina said. "While this type of behavior by an individual is extremely rare, it's unacceptable and clearly it has consequences. Committing fraud, whether it takes place on or offline is against the law. We are fully cooperating and assisting law enforcement officials to recover every dollar withdrawn by Ms. McClure and Mr. D'Amico," GoFundMe said in a statement. McClure, 28, D'Amico, 39, and Bobbitt, 34, were all charged with second-degree theft by deception and conspiracy to commit theft by deception. McClure and D'Amico voluntarily surrendered to authorities on Wednesday, and have since been released, Coffina said. If convicted, each of them faces five to 10 years in prison, prosecutors said. Hoping to repay Bobbitt for the apparent generous act, McClure said she and D'Amico set up a GoFundMe online. The fund was launched on Nov. 10, 2017, just hours after D'Amico took a of photo of McClure posing with Bobbitt near the I-95 exit ramp, Coffina said. "I just got her gas to help her get back on her way. I didn't think anything about it. I wasn't expecting anything in return," Bobbitt told "Good Morning America." "That's how I got the money to start with -- from other people. [I had to] return the favor. I can't constantly take and not give back." Asked who came up with the idea of the scam, Coffina noted a 2012 post Bobbitt made on his Facebook page that was "remarkably similar" to the narrative on the GoFundMe page. Among the few things about the story that's true is that Bobbitt did serve in the Marine Corps and was homeless, Coffina said. "He deserves our appreciation for his willingness to serve our country as a United States Marine and he has our sympathy and concern for the homelessness that he's experienced, as well as his publicized struggle with addiction," Coffina said. "But it is imperative to keep in mind that he was fully complicit in the scheme to defraud contributors, promoting the campaign in multiple media appearances and posing with Amico and McClure for a Philadelphia Inquirer story in front of a gas station that he did not buy gas from." "He was certain the payday from the book deal they were pursuing would dwarf the money from the GoFundMe campaign," Coffina said. "A few months later, when the dispute with Bobbitt became public D'Amico was not dissuaded. Instead, he pitched a title for the book that would encompass the controversy, 'No Good Deed.'" Bobbitt's 81-year-old grandmother, Betty Grissom, of North Carolina, told ABC News Thursday that Bobbitt had always been a "fine young man." "He had been in the Marines and he worked with a paramedic group and we all heard ... how great he was, and he just let the drugs take over," said Grissom, adding that she hasn't seen or heard from her grandson since he left her house in 2014. "When he had his drug problem, I know he did things he should not have done, but I cannot believe he was involved in this type of hoax," Grissom said. "Until Johnny comes and tells me personally he did it, I cannot believe it." ABC News' Luis Martinez, Alex Hosenball and Gerry Wagschal contributed to this report.